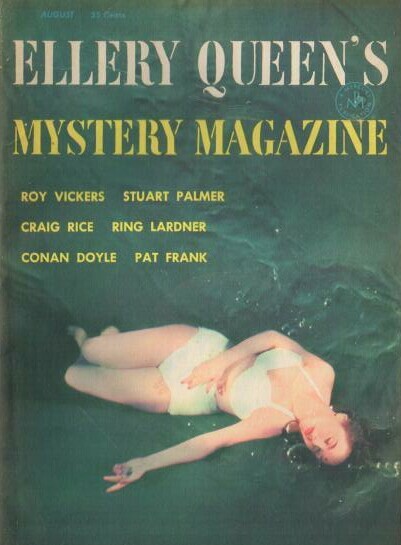 The cousins would publish a few more stories in This Week over the next few years, but they also branched out a bit more, publishing in a variety of magazines, including Ellery Queen’s Mystery Magazine, who is where this story appeared in August, 1954. This was also the last to appear story to be included in Queen’s Bureau of Investigation (1955). Fancy verbal acrobatics are the pleasant preoccupation of detective fiction. In real life they don’t happen. A man who will perform the miracle of forcing his dying brain and muscles to commit a message to paper is not trying to be subtle or clever. If he knows who did the job on him his efforts can have only one purpose: to transmit that information as directly as he can. Clint Fosdick, in writing those two letters, GI, was trying to do just one thing: name his killer. And yes, this one does have a dying clue, the two aforementioned letters, GI, and three suspects, the victim’s sons, named after three US presidents: George Washington, Abraham Lincoln, and Woodrow Wilson. Ellery has to figure out which name the victim had been trying to write as he died. I’ll bet you’ve already figured out the solution!